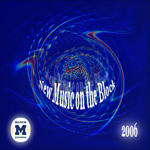 New Music on the Block (2006) was Block M Records' 2006 competition of original music composed, performed, recorded and produced by University of Michigan (U-M) students. The winners performed their music during two nights of celebration in the Duderstadt Center's Video Studio in October of 2006. Video clips can be seen below. A panel of three judges selected winners representing a variety of musical genres out of fifty-six individual submissions that were submitted by twenty-one groups and individuals. Special thanks, again, to this year's judges: Erik Santos (Associate Professor of Music [Composition], School of Music, Theatre & Dance); architectural acoustician, John Storyk (Partner/Co-founder, Walters-Storyk Design Group); John Merlin Williams (Director, The James and Anne Duderstadt Center and Executive Producer, Digital Media Commons). Click the images above to view videos from the 2006 New Music on the Block concert. Problems with video streaming? Check the Media Streaming FAQ. More information about New Music On The Block (2006) coming soon!